In an ongoing Revenue Management process it is important to be able to evaluate how well you are doing. 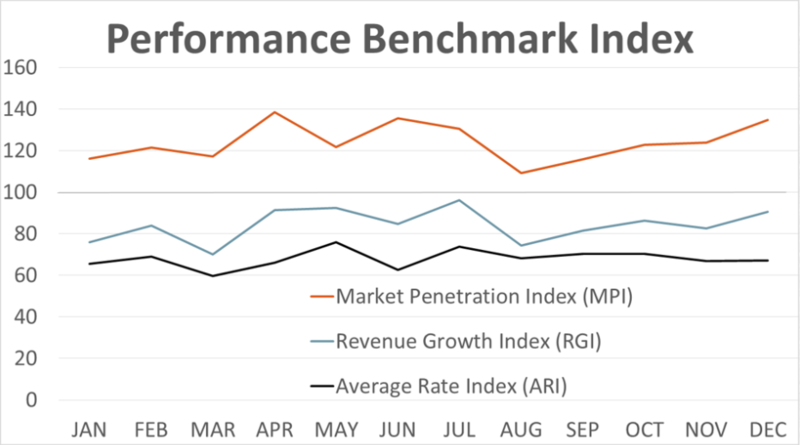 So let's take a closer look at how we can compare performance benchmarking between hotels, in a way that is not subject to the failures of budgets. 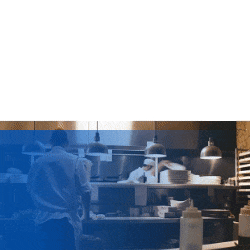 A note: A basic knowlege of hotel and revenue management best practices is recommended in order to follow along with some of the examples below. But if you need to look up any terms, you can always use The Hotel Technology Index! The first index I would like to look at is the simplest to understand and calculate: The Average Rate Index or (ARI). The idea is to convert your average achieved rate into an index (out of 100) compared to the average rate that your competitors have achieved. 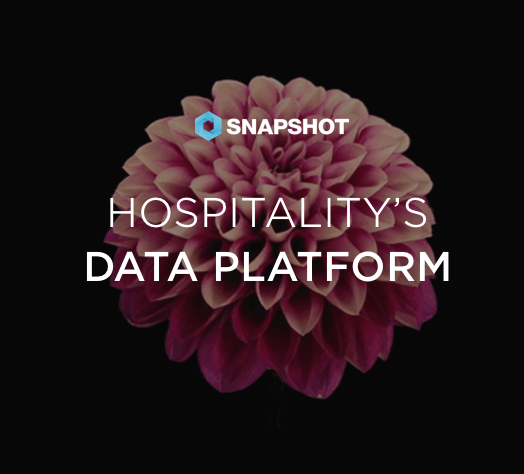 The value of this is it standardizes your comparison across an estate of hotels and puts your performance in the context of the competitive set; rather than on the basis of the actual number. 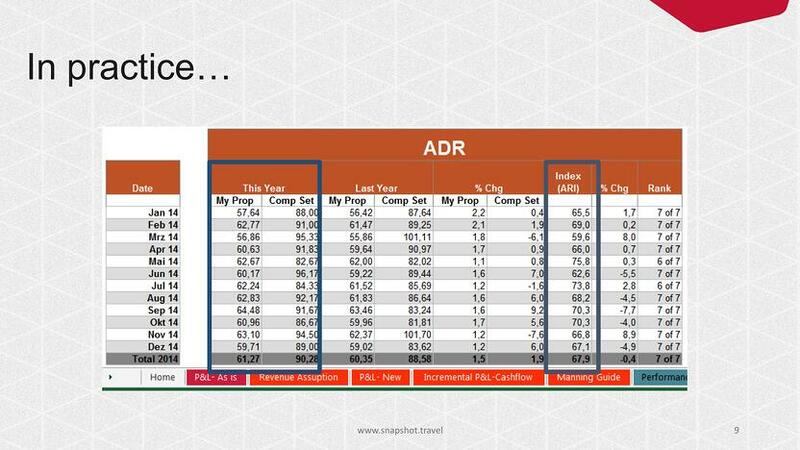 To get to an index you calculate your ADR divided by the average consolidated market ADR. Let’s look at January 2014 in this example below. My ADR for this property is 57,64 while the competitor set has on average achieved 88 EUR in January. 57,64 divided by 88,00 multiplied by 100, gives us an index of 65,5. So in other words we are only achieving 65,5% of the rate that the competitors are achieving. 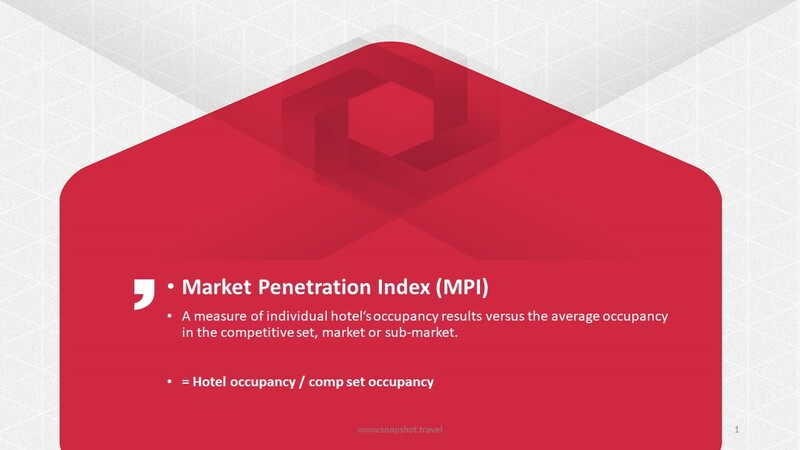 Market Penetration Index is a little more complex, as we have to take into account that hotels have a different number of rooms. The Market Penetration Index tells you what occupancy your property has achieved in relation to the market occupancy. If you have an MPI over 100 it means you have stolen some of the reservations from your competitors. On the other hand if your MPI is below 100, you know that some competitors have stolen rooms from you. So that begs the question: What is fair market share for a hotel? Well if there are 5 hotels in a given sub market, you might suspect that the fair market share of each hotel is to get 1 room out of 5 sold to the market. However, what do we do when hotels have a different number of rooms? It wouldn’t really be fair to compare the number of rooms a 1000-bedroom hotel sells to a boutique hotel with 45 rooms would it? Below is a slide detailing how you can calculate fair share. Add up the total number of rooms in the market. 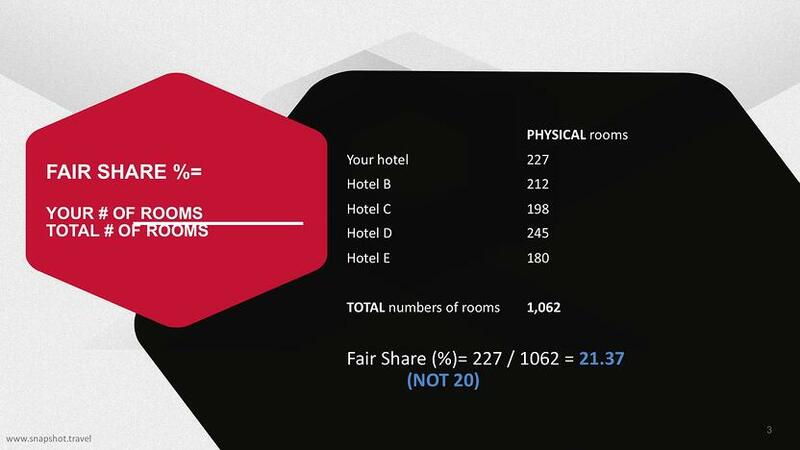 The fair share is your hotel's number of rooms divided by the total number of rooms in the market. 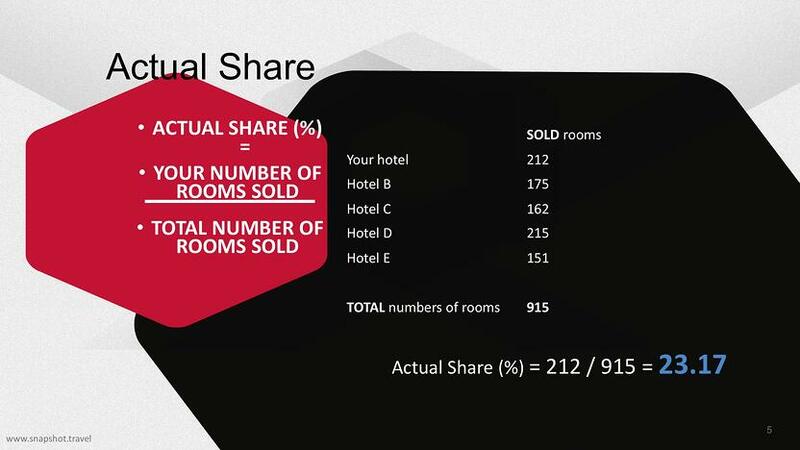 In the example below your hotel has 227 rooms, and therefore has 21,37% fair share. The fair market share for a hotel is the percentage of rooms that it contributes to the market. Actual Share differs from Fair Share in that this is what you've actually achieved– the amount of rooms actually sold rather than your percentage of the total market (number of rooms available). Now let’s look at the results for a particular day, below. In total the market sold, 915 out of 1062 were sold so the market occupancy was around 86%. But was the share of rooms sold distributed evenly? In this case your hotel sold 212 rooms. 212 out of 916 means you sold 23.17% of the rooms sold yesterday, more than your fair share. Good job! Although the MPI and ARI are very valuable you might recognize that they tend to work in different ways. Usually, the higher your MPI, the lower your ARI and vice versa. So we seem to need a third index to give us an indication if we have made the right choices balancing between rate and occupancy. So when we look at indices we also need a RevPAR index. 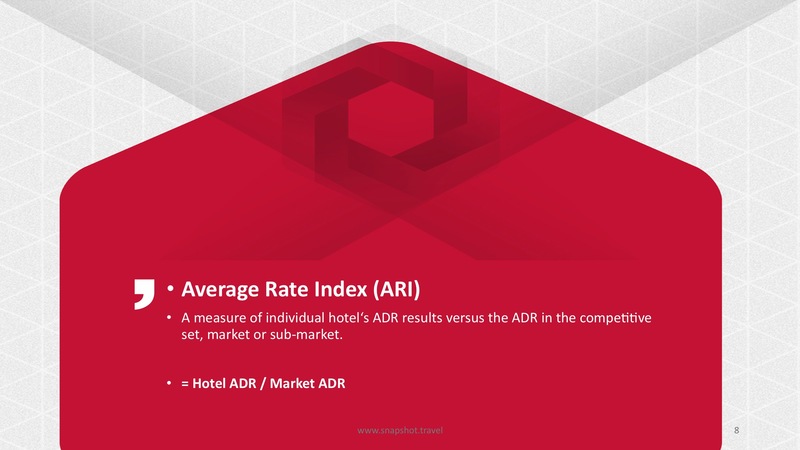 Since that is such a terrible name, we tend to use Revenue Generation Index, but no matter what you call it, it is in many ways the king of measuring a hotels performance. Your Revenue Generation Index is a way for your to compare your RevPAR with the average RevPAR accross the market. This is valuable for understanding if your hotel is bringing in enough revenue in relation to the market, compset, or sub-market. If your RGI is higher than 100 then overall you are generating more revenue than your competitors. If however you are below 100 then you are trailing your competitors. In practice, you can figure out a lot about a hotel just by seeing its ARI, MPI, and RGI. For example, for the property on the right you can see that they are high in occupancy and low in rate, while overall underachieving. Without any further information, I would suspect that the hotel should be either increasing rates or shifting segment focus to higher rated business. But looking backward at performance is not a Revenue Manager’s main job. Looking into the future is even more important. Want to learn even more? Check out our Demand Management Online Course on Coursera!